In some beaches are sunbeds and parasols. 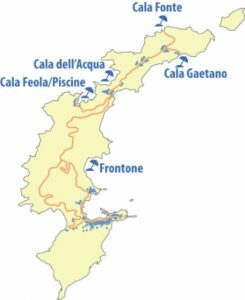 From Ponza center you can go to the Frontone beach via the many shuttles Gable. The beach consists of fine gravel and you can rent chairs, umbrellas and there are chemical toilets and small eateries. The beach can be reached on foot via a walk of about 20 minutes from the main road. In Le Forna, reachable by bus or by car, there are more points to go to the sea for free. Cala Feola, sandy beach reachable via several steps, is a beach with rental chairs, umbrellas and refreshments. The Piscine naturali, natural swimming pools, are equipped with flat rocks always hire sunbeds, umbrellas, food court and boat rental possibilities. pools also can be reached along a narrow road and a few steps. Cala dell’Acqua is always formed by simple rocks where to dive and you can rent boats, fishing boats, sun beds and umbrellas. The bay is easily reached on foot, by scooter or car. Also Cala Fonte is easily accessible on foot, by scooter or car. Here you will find a lady who can carry you on the rock face where the sun beds and umbrellas are positioned. The food court is on the mainland. Cala Gaetano, at the very end of the island, is a really isolated place and especially also because you have to descend hundreds of steps. A series of large rocks will be the bottom of the hill where you will enjoy a private day at the beach.